Adventureland-UAE is an indoor family entertainment center in the Sahara Centre shopping mall in Sharjah, United Arab Emirates. The center has an area of 70,000 square feet (6,500 m2), making it the largest family entertainment center in the Middle East. No doubt Adventureland-UAE is a family entertainment centre showcasing 20 major rides, video and simulator games, bowling alleys, a billiard hall, internet network & gaming, and a themed sports cafe. 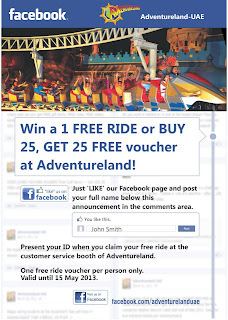 Adventureland-UAE is offering free ride to its facebook fans. Just like the facebook page and update your name in comments column. Offer will ends on 15th May 2013. So hurry up guys!! !